There are some of us out there who love collecting watches, and over the years, we have actually amassed quite a collection of timepieces. Now, if these watches were digital, then the matter of replacing its battery is a simple one, but when it comes to winding your watches, you have several options. 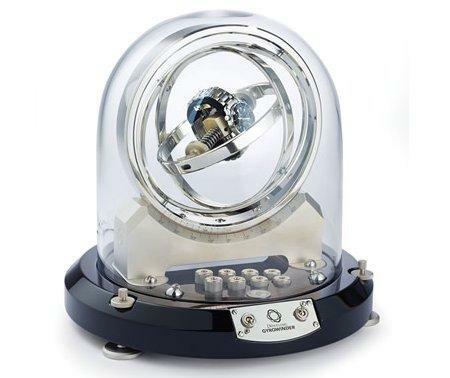 If your home looks extremely high tech and you want to go all the way, why settle for a typical watch winder that just spins in one direction, but rather, opt for the $18,000 Gyroscopic Watch Winder? The Gyroscopic Watch Winder is proud to be the “only gyroscopic watch winder” which will be able to rotate 360°, meaning it does so in all directions. Specially inspired by the aerotrims that were used by astronauts in training so that they can avoid spatial disorientation in space, the watch winder will rotate on a trio of axes, in the same manner as that of a human wrist. It does so in order to wind an automatic watch which has been wrapped around the center of the gyroscope. Specially made in Germany by Döttling, this particular watch winder is handcrafted over a four-week period by artisans, and it is propelled by an electric motor in order to deliver whisper-quiet operation. A quartet of LEDs will light up the rotation with crisp white light, and it is smart enough to pause automatically to prevent overwinding.